The injunction issued April 16, 2013 by Supreme Court Justice Oswell Legall remains in effect as the application to lift the injunction was not heard today. Oceana in Belize, along with Co-Claimants Citizen Organized for Liberty & Action (COLA) & the Coalition to Save our Natural Heritage, won a historic legal victory when Justice Legal delivered his judgment in Claim #810 of 2011.The judgment declared all six offshore Production Sharing Agreements (PSAs) “unlawful, null and void.” Judge Legall furthermore granted “an injunction restraining the defendant, servants and agent from carrying out the provisions of the PSAs. Shortly after its loss in court, the Government stated its intention of appeal the decision. At the behest of Princess Petroleum Belize Limited and Providence Energy Belize Limited government applied for a stay of execution of the injunction. The hearing of that application started before the Chief Justice today. 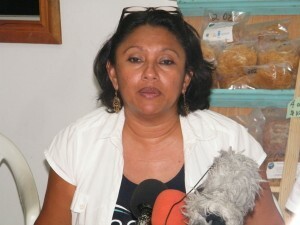 However, Chief Justice Benjamin adjourned the hearing until next Tuesday, June 4 Government’s lawyers Denys Barrow, SC and his daughter Naima Barrow as well as the counter submissions made by Oceana and its Co-Claimants, arguing that the injunction remains in force until the appeal is heard by the Belize Court of Appeal. “Among other reasons, we feel Government’s application for stay should fail because: a stay would deny the very effect of the judgment and cause an unlawful situation to remain in force; the evidence in support of the application for stay fails to approach anything near credible evidence of ruination, irremediably or irreparable harm that would justify departure from the general rule that a successful party would not be deprived of the fruits of his judgment; and the appeal has no prospect of success,” stated Oceana Vice President as she briefed the media after today’s hearing. Senior Counsel Eamon Courtenay stood in for Oceana’s Counsel Godfrey Smith, SC at this morning’s hearing, while Senior Counsel Antoninette Moore made her first appearance on behalf of the Coalition.